Transformer monitoring systems are used for the supervision of transformer’s condition and status. The monitoring is an essential part of transformer systems for the sake of problem diagnosis, smooth working and proper maintenance of the equipment in large industries without any work getting hampered. The transformer monitoring systems are helpful as these systems are equipped with database storage systems for lifetime and integrating sensors which help in proper monitoring of the transformers for efficient processing and operations. 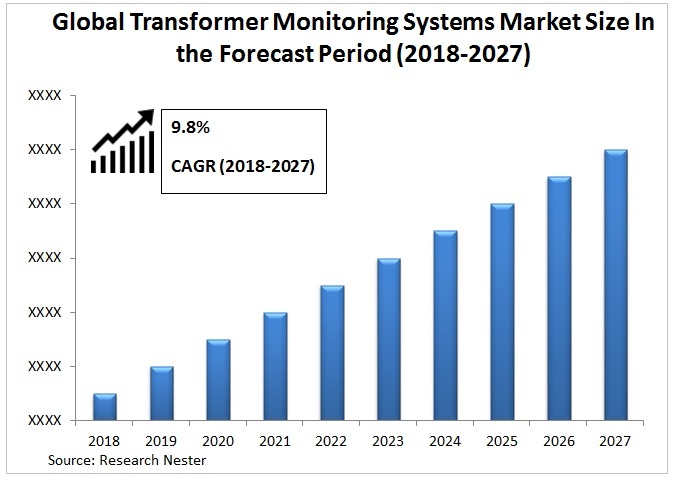 The transformer monitoring systems are anticipated to gain a significant growth rate over the forecast period on account of increasing industrial activities along with increasing development of power grid network across the globe. Transformer Monitoring Systems Market is anticipated to record a significant CAGR of 9.8% over the forecast period. Many multi-national companies are concentrating towards new product advances in transformer monitoring systems. Moreover, the many advantageous properties of transformer monitoring systems are exploited in the field of energy distribution now and then. The market for transformer monitoring is predicted to showcase a vibrant growth rate on account of rising smart transformer technologies which is estimated to create an increase in demand for energy efficient monitoring systems with stringent compliances from the government’s side across the globe during the forecast period in the energy associated industries. Moreover, increasing urbanization as well as growing industrial activities are calling in for higher energy demand across the developing regions which is anticipated to work as one of the key factors in the growth of transformers monitoring industry. 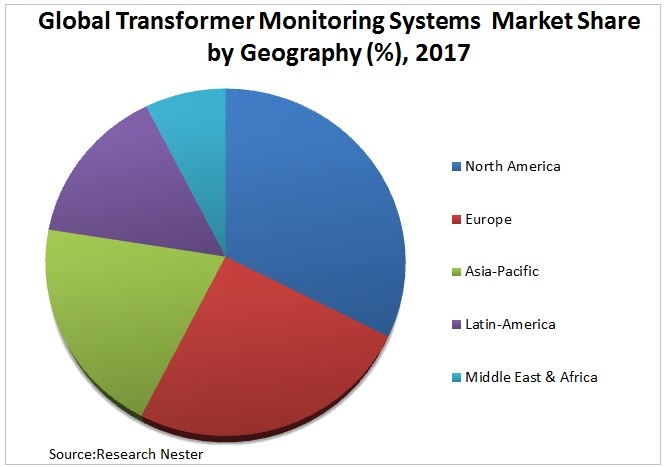 On the basis of regional platform, global Transformer Monitoring Systems market is segmented into five major regions including North America, Europe, Asia Pacific, Latin America and Middle East & Africa region. As the most developed region in the world with steady industrial growth, North America is panned to observe substantial transformer monitoring systems market growth during the forecast period. North America is followed by Europe in terms of energy consumption due to expanding energy sector activities with increased energy requirement thus, swelled transformer monitoring systems usage. The market for transformer monitoring systems is expected to grow on account of increasing smart grid initiatives and rise in demand for power generation from both non-renewable as well as renewable sources in the market. The ever rising demand for renewable investment in the huge industrial sector is expected to keep a high demand rate for transformer monitoring systems in the market over the forecast period. The transformer monitoring systems globally offer new ideas for wooing investments to make in the energy sector such as development of big data analytics and rapid installment of power transformers for the purpose of offshore installation of wind farms. The transformer monitoring system is anticipated to showcase a phenomenal growth over the forecast period on account of rising demand for monitoring of energy consumption of non-renewable energy sources as well as bushing monitoring in transformers. Additionally, the rising requirement for efficient energy transmission and distribution using huge resourceful power transformers is predicted to contribute a large chunk in the overall value of transformer monitoring system market over the forecast period. Moreover, the dependency of the energy sector on transformers which aid in the fluctuation of voltage calls for efficient monitoring of the electrical energy being voltage fluctuated, which is possible only by the means of transformer monitoring systems. This is estimated to create a steady demand for these systems across the globe during the forecast period. However, dissolved gas analysis is anticipated to fall in growth over the forecast period owing to the introduction of bushing monitoring systems in the transformer monitoring system market in the recent past. The introduction of new technologies is anticipated to behave as a restraining factor for the growth of the traditional methods of transformer monitoring systems over the forecast period across the developed and developing regions of the world.